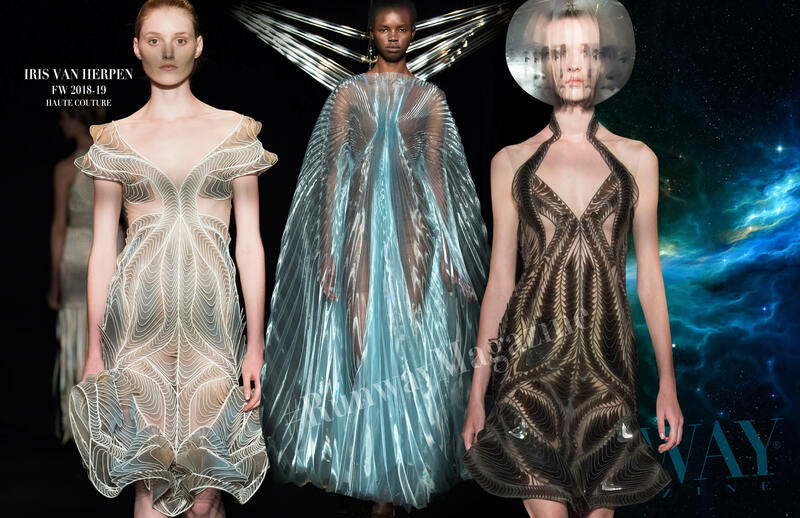 Iris van Herpen Haute Couture Fall-Winter 2018-19 called “SYNTOPIA”. 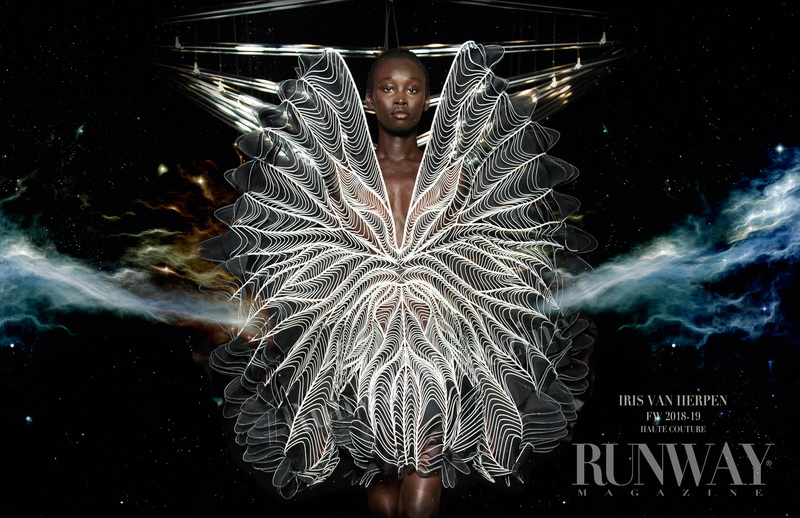 In this collection Iris van Herpen explores the new worlds that arise within synthetic biology and the intertwining relationships between the organic and the inorganic. ʻSyntopiaʼ acknowledges the current scientific shift in which biology converges with technology and visualizes the fragility and power within. For Syntopia, Van Herpen collaborates with the artists Lonneke Gordijn and Ralph Nauta of Studio Drift, whose biomimic art works translate natural processes by breathing life into delicate immersive sculptures through movement. For this show Studio Drift has created a spatial kinetic installation ʻIn 20 stepsʼ constructed of 20 delicate glass wings that represent all the different steps of flying in an abstract way. The vivacious glass bird flows in symbiosis with the models while they move over the runway, their delicate interaction emphasizes the fragility of new worlds living and soaring together. ‘As a former dancer, the transformation within movement has hypnotized me. For this collection I looked closely at the minutiae of bird flight and the intricate echoing forms within avian motion. The artists Studio Drift and the scientist Etienne Jules Marey inspired me to look more closely at the draping of a garment through chronophotography. By slowing down time into split seconds I started breaking down the usual draping of fabric, to then layer the milli-seconds all slightly shifted, like the layering of a bird’s feather.’ says van Herpen. The collection begins with one of the oldest artisanal techniques – weaving. Here, traditional weaving and cutting-edge, digitally designed weaving intertwine to create a series of ʻSyntopicʼ coats and dresses in laser-cut wool that are woven with leather through parametric file making to literally cut into time. Transparent silk organza is pleated and liquid-coated, their transparent folds continually overlap in different directions to slow down movement, resembling the glass lines of the showʼs kinetic installation. The ‘Inside a secondʼ technique translates the artistry of Studio Drift and the chronophotographic lines of birdflight into thousands of two-toned transparent organza layers that are lasercut and heatbonded with mylar and cotton, that drape like time-lapse motion. The mini ʻMimesisʼ corset dresses are made from birdʼs soundwave patterns that are lasercut of mylar, black cotton, red organza and transparent black acrylic sheets, layering the silk and acrylic like a featherʼs architecture.